930 Sq.' Fully Furnished Upscale 1 Bedroom, 1 Bath Beachfront Apt. We are located on the beach and our nearest beach side neighbors are approximately 2 blocks away providing our guests with an isolated beach experience that is not easily found in the Central Florida Atlantic area, and for a price that is difficult to beat with no deposit or cleaning fees. Our rental features oceanfront living with easy access to the beach and a wonderful 60'x8' private porcelain patio. Enjoy shell collecting on your leisurely walks down this deserted, unspoiled beach just a few steps outside your door. Encounter an ocean bottom free from coral and rocks as you swim, fish, surf, and sun bathe. Ride your bicycle on the paved bike path that follows the sea for miles past seaside villages with shops and restaurants. Relax on your porcelain patio and be enchanted watching seasonal blue herons, sand pipers, ibis, skimmers, sea gulls, terns, and pelicans in formation. Remain quiet and a cardinal or scrub jay might surprise you. Look beyond the shoreline to see porpoises playing in the surf or an occasional sea ray flying through the air. Be fascinated by giant sea turtles laying their eggs in the sand after dark during May through August. Delight in the eruptions of turtle nests as hatch-lings make their way to the sea in the early mornings of July to October. From the living room, dining area, and kitchen, the Great Room provides a panoramic view of the ocean through a wall of glass. The private bench swing nestled within natural Florida foliage on top of the sand dune offers an even closer look at the shoreline just a few feet from your patio. The apartment's 10’ ceilings make every room more spacious and marble floors, lighted fans, oil paintings, numbered prints, granite counter tops, and a wood burning fireplace create an ambiance of luxury. There is central air conditioning and heat, but for those guests who prefer fresh air and the sound of the surf you can open the screened sliding glass doors to create the feeling of being outdoors even without stepping onto your expansive patio containing a private multiple person hot-tub. And if you wish to leave your retreat to play golf or tennis or to explore the Indian River Lagoon by canoe, kayak, sail or power boat, you are just minutes away. Or if you decide to travel a little further, you can visit Kennedy Space Center, Port Canaveral, Disney, and the Orlando attractions. 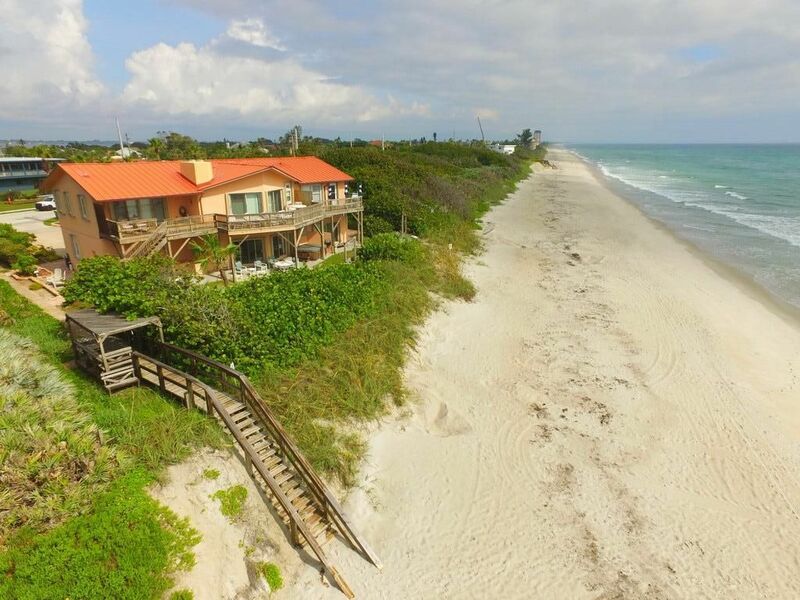 Melbourne Beach House is an experience not to be missed! As I was riding down the beach to Sebastian State Park many years ago this exceptional property jumped out at me and I wondered who lived there. As fate would have it I met the owner who later became my wife. When we took early retirements from our professional jobs 15 years ago, we joyfully decided to become inn keepers by sharing our little piece of paradise with others. The house was designed and built by my wife in 1978 and was completely refurbished inside and out in 2008. She explored many beach communities in Florida prior to moving here and chose Melbourne Beach because of the county's ecological sensitivity, including conservation and building height restrictions. We truly love this place! Its isolation, beauty, and distinctive offering of the finest sand beach with no hidden coral under the water to worry about is wonderful. The fishing is great as is the surf break and swimming. Just spending time in a beach chair next to the ocean provides hours of relaxed joy for us. Although VRBO locates us at the subdivision of Beach Woods, they are mistaken. Melbourne Beach House is not located in any subdivision or community. We are a unique stand-alone property situated within a nature preserve. We remodeled the house to further reflect our relaxed, informal, peaceful lifestyle. Although we created 4 lovely apartments we directed more of our resources to the two executives, one in which we chose to live. Attention to detail with marble floors, wood burning fireplaces, granite and tile kitchens and bathrooms, custom oak and pine crown molding and baseboards, and tongue and groove oak and cedar accented walls was our focus. Most of all the walls of sliding glass doors that allowed a spectacular view of the ocean, sunrises, moon rises, lightning storms, and rainbows were very important to us. Outside we created intimate conversion areas with stone and porcelain patios, wood decks, and bench swings among lush flowers and native foliage. We acknowledge that an additional wonderful amenity about our location here is that we can ride our bicycles less than 1 mile to the supermarket or we can peddle 3 miles to the quaint seaside town of Melbourne Beach. We believe we have it all! Pleasure yourself before bed time with a soothing bath in the deep, ceramic tiled Roman tub or choose a refreshing shower in the same tub or separate shower enclosure. Two unique glass wash basins reinforce the feeling of luxury. We are on the dune just in front of the ocean. All of our apartments have fantastic views of the beach and ocean. We sit on the dune directly on the beach -- any closer and you'd get wet. Through a wall of glass or from your patio or garden bench swing you will see the Beach and Ocean. The ocean is steps from your front door. Come inside to cool off in the central air conditioning. Turn on the central heating system on those few occasions that require it. Wrap yourself in one of the two full sets of high end linens and select from soft to firm pillows to nestle your head. Be mesmerized by the beautiful colors of the fire in the wood burning fireplace set in a brick wall. Utilize the variety of towels including 2 sets of bath towels, dish towels, spa towels, and beach towels. Clean-up will be easy in the full size dishwasher. Cool your groceries in the full size refrigerator complete with ice maker and wine sleeve. Cook your favorite dishes on the modern easy to clean glass-top stove. Bake or broil your roasts in the full size self cleaning lighted oven. Reheat or cook your meals in the large built-in microwave. Sip coffee all day from the 12 cup Black and Decker coffee maker. Toast your bread or bagels to compliment your meals. Enjoy your meals on various dishes using heavy stainless flatware. Drink your beverage from a wide selection of glasses. Colbert blue glass dishes, tumblers, and wine glasses compliment the ambiance. Create culinary delights on granite counter tops with matching center island and breakfast bar in the very large stylish kitchen complete with everything you need for gourmet meals or quick snacks. Watch the waves roll in as you ingest that delicious meal from the counter height dining table. As an alternative eat at the breakfast bar or outside shaded patio table as you view the ocean. Two awesome stereo systems with ceiling mounted sansui and incredible studio speakers. We provide beach chairs, umbrellas and other beach toys. Enjoy the wonderful common area featuring a stone table with benches, a conversation group, and a bench swing surrounded by native foliage. Lush flower gardens frame the property. Relax on your private 60' porcelain patio adjacent to the beach. Stay up late to watch the stars and planets slowly traverse the universe or wake up early to view the sun rise over the ocean from your 6 person private hot tub. Beach chairs, beach umbrellas, and limited beach toys are provided. You will need only a small grill and a fishing pole if those items are important to you. We had the perfect stay with beautiful views, quiet walks and rest. Couldn't have been nicer. Thank you! Comfortable space, fantastic view, good restaurant options nearby. My husband and I thoroughly enjoyed our stay! George and his wife were so welcoming and accommodating, greeting us upon our arrival. The apartment's location was great, both being directly on the beach but close to Publix. They really have focused on the little details to make you feel right at home...which we did. It was the perfect place to return to after a crazy day out in the world. We called it our "calm retreat!" and we enjoyed the swing and the beach. My wife and I are both teachers on our fall break. This was just the relaxation we needed! Great location! Loved the place walked out back sliding glass doors and there is the ocean. Loved the size of the kitchen area. My wife loved all the ceiling fans. Will definitely go back, had a great time! very well maintained. The owners was very pleasant and helpful.
. I recommend this property for any couple that is looking for a romantic getaway. We invite you to spend time with us -- Relax on your patio and be enchanted watching an abundance of sea birds overhead or feeding them on the beach. Walk the beach in search of unique shells and sea glass. Swim or splash in the water of our pristine subtropical turquoise ocean. Board surf, kite surf, or paddle board the best breakwater in the area. Surf-fish for dinner from the shore. Watch sea turtles lay their eggs at night. Bicycle past villages that follow the sea for miles. Play golf or tennis, canoe, kayak, sail, or power boat just a few minutes away. Visit Kennedy Space Center, Port Canaveral, Disney, and the Orlando attractions a little over an hour away. We are in the perfect location to visit most of Florida within a day.